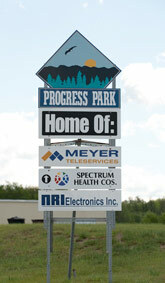 Progress Park is a 240 acre business park nestled in a tranquil setting of abundant pine trees and impressive rock formations. The Park is situated between the cities of Virginia and Eveleth, Minnesota. Entry to the business park is located along Highway 53, across from Lundgren’s Ford dealership and adjacent to the Slumberland Furniture store. The Park is owned and operated by the Virginia Eveleth Economic Development Authority (VEEDA).